Metal Dragon had often shared offices with D1 Recordings. As the D1 office moved from building to building, so did one particular decorative item. A framed poster of the globe with 'Drexciya' scrawled across the front of it in silver. 'Drexciya' and 'Underground Resistance' were a large part of the influence of Detroit techno on the emerging Irish electronic music scene. Starting in 1991, 'UR' were the first Detroit based act to play techno live and the first group to use a DJ as a band member. They have since been hugely influential in electronic music and have always remained independent. One of the keys of their campaign is the creation of alter-egos, crusaders who bring electronic music to the world. 'UR' created the 'Interstellar Fugitives' and 'Drexciya' presented their audience with a team of aquatic commandos. 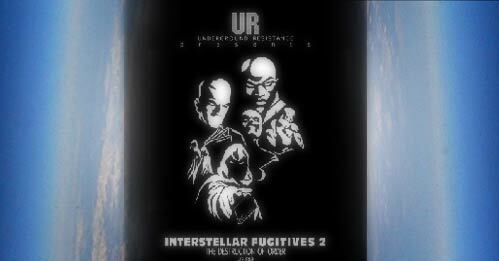 Via their Interstellar Fugitives, 'UR' brought their music, in the words of their unknown writer, ‘Nation 2 Nation, World 2 World, Galaxy 2 Galaxy’.